I’d be hard-pressed to pick a favourite snake from my collection, but it’s not hard at all to figure out which snake is the most popular with our guests. It’s Snuggles, our four-year-old male boa constrictor. 1. We made sure we got a male. Like garter snakes and water snakes, boa males are much smaller and more slender than females. If you see an eleven-foot, hundred-pound boa constrictor at a reptile zoo, that’s a female. I don’t think males get much larger than eight feet. Much easier to manage. 2. Snuggles comes from a small bloodline: I don’t think either of his parents are larger than six feet or so, so there’s every hope he’ll stay a reasonable size. After four years he’s around four feet. It’s also possible that he has some Hog Island boa in his ancestry: that’s a dwarf race that has a chameleon-like ability to change its skin colours, and Snuggles’s skin has lightened and darkened like that. So with Snuggles I think we’ve hit a sort of snake size sweet spot that people respond to positively: large enough to be impressive, but not so large as to be intimidating. All our snakes larger than four feet are popular with guests and audiences: Lucy, our female bullsnake; Lucifer and Lilith, my black pine snakes; and Nic, Jennifer’s Everglades rat snake. Big and friendly is a winning combination, but for some reason Snuggles is special. Maybe it’s something specific to boa constrictors, but I haven’t figured it out yet. I’ve long felt that, with reticulated pythons and yellow anacondas readily available in the pet trade, if someone absolutely has to have a big snake, there’s no better big snake than a boa constrictor. Of course, you always have to follow local ordinances, so if your city bans them along with the big guys, you’re out of luck. 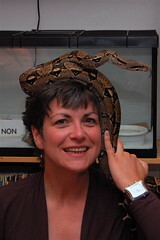 But either way I’d much rather you kept a boa constrictor than a Burmese python: just as tame, but easier to manage. And when you screw up and your snake gets confused (as it will, because it’s really dumb) and mistakes your face for food, it won’t cost you your life.